Targer Engineering & Consulting is currently implementing a six-month consulting and engineering project for Mann + Hummel BA in the field of plant designing, developing a new layout layout and production operations. Mann + Hummel BA is a member of the German multinational company Mann + Hummel since 2005 and currently has over 600 employees with a growing trend. The tradition of the production of filter on the Tešanj area has been present since the 70s of the last century, the factory has grown from the Unis Pobjeda company and the birth of Unico Filtteri. The main business of Mann + Hummel is the production of oil and air filters for motor vehicles. 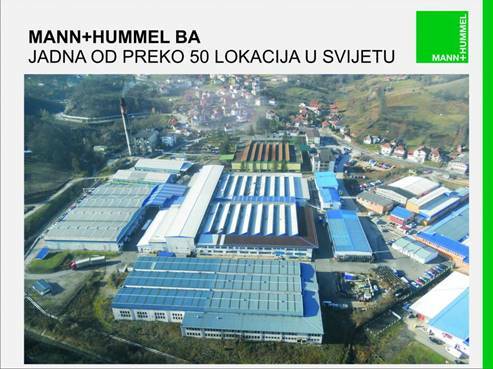 With the aspiration and plan for further development of production plants in BiH, thanks to the reputation and reputation that have been made by employees and management from Tešanj in the parent company of Germany in 2005, a strategic decision was made to expand the production and construction of a new logistics center that would adequately follow further development and increase in quantity and assortment in the plant located in the industrial zone Bukva - Tesanj. In the first phase after the strategic decision on expansion and construction of the LC was acquired, the production hall of the neighbor company Pobjeda Tešanj was purchased. New Building Block (LC) was cleaned and will be used for Greenfield's investment by standards already established at Mann + Hummel in Germany. After reorganization and expansion, the goal is to use part of the current production facility to transfer production from nursing plants in Czech and Germany. As a result of the project approach and synergy invested in the current part of the project, the results of such systematic work are monitored: long-term minimization of material flow costs, functional division by filter types, reduction of stock in the process using the Pull principle, reducing inventory manipulation times, Lean's approach to more efficient and effective production, flexibility of production site, etc. By the end of July, the goal is to have almost a solution to the spatial planning and to implement them in new plants during the construction of a new logistics center and the reorganization of the entire production site. Targer E & C has an extraordinary honor to be part of the project and to provide its advice, experience and expertise with a positive flow of definition and development of a new spatial layout in a multinational company such as Mann + Hummel BA. Readiness to change, exchange and adopt opinions, co-operative as noted by Mann + Hummel BA's technical staff and management can serve as an example of positive practice. We are also looking forward to the fact that the expansion project and the efficient spatial planning will lead to the opening of new jobs in BiH and in the municipality of Tešanj. This project also fills out a socially useful component that is particularly rewarding for us. We are grateful to the management and staff of Mann Hummel BA, and especially to the direct project participants.